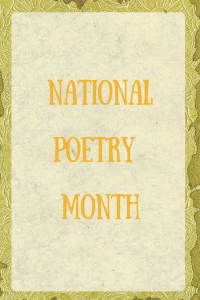 April is National Poetry Month, and since I actually really do love poetry, I thought I’d share some different posts this month that relate to poetry. There will be some of my favorite poems, some book reviews of verse novels, and more! If you’d like to see something in particular, just let me know and I can try and fit it in. I’d really love to share things that all of us would enjoy, and maybe some of these posts will change your thoughts on what poetry can be. For now, I thought I’d share a poem that I love (found here). Enjoy! Poetry is a something I need to work on expanding my horizons. I just read a bio on Dorothy Wordsworth including poems she wrote and how she influenced her brother’s poetry. It was a good way to ease me into Nat’l Poetry Month. Ah, the bitter sweet of ‘I’m in Paris with You’. I can see why you like it, Lauren. Thanks! Poetry. Dang! Can’t remember the last time I read one. I really need to get back! That’s cool that it’s national poetry month! Simon’s class has been working on poetry all year! I’ve never read this poem, I enjoyed it! I used to write a lot of poetry back in the day but I haven’t really kept up with it. I always enjoyed the creative release from in though! I used to write poetry in high school and I found some of my old poems not too long ago. This is a great poem… and, Paris is one of my fave cities! I had no idea it was national poetry month! I loved poetry in college! I’ve written poetry and prose for years and actually just submitted a book proposal last month to try and get my own book of poetry published. I don’t expect to hear a yes (simply because it’s my first proposal) but I’m currently working on finishing up some of my own poetry. I also happen to have a rather large collection of poetry books. This poem would be a great song! I absolutely love this poem. I think it can relate to so many different people. I can’t remember the last time I actually read a poem, need to read them more often. I haven’t really read any poetry since college, I need to get back in to it! What a great poetry find. I have a few poets that I enjoy reading from time to time. I may have just found a new poet to check out. Paris is always a good idea. I love this poem and I love all things Paris. Thank you for sharing. I love poetry and I used to write so much of it in my younger years. I don’t know why I stopped. This is such a great one. Do you follow Button Poetry? I absolutely adore all the poets on there. They do live standups on youtube. It’s on Facebook. LOVE IT. Oh no, I haven’t heard of Button Poetry. I need to check it out now! Thanks for sharing. I honestly can’t remember the last time I read a poem that was not written by one of my children! I miss teaching poetry in high school! I don’t read much poetry these days, but this one was very enjoyable so thanks for sharing it. I love that poem! Thanks for sharing it! We are going to do a poetry display next in the library. My co-librarian is a poet, so I’m letting him be in charge. Fun post!